Begun over 45 years ago, Henninger Hill Apiary operated as many as 260 colonies until, in the early 80's, family responsibilities and the demands of "real" jobs, teaching high school students, took overwhelming priority. Operations were reduced to a smaller scale beekeeping level, with limited hives, honey and wax production. Swarm retrieval, however, continued unabated. In 2002, upon retirement after 38 years of being a classroom teacher, the bee business was expanded in an attempt to maintain Alan's sanity. Retirement can be tough, boring and lonely. Now, in an attempt to at least appear retired, we aim to keep less than 100 colonies and divide our operations between pollinating almonds and honey production. The long term goal in our apiary is to develop a strain of bees that have increased genetic diversity and resistance to diseases and parasites. To this end, we still collect swarms to diversify our gene pool, and use limited or no mite and disease treatments to allow the bees the time to develop their own resistance. We, also, have expanded the number and range of our bee yards emphasizing adequate nutrition and variety of bee pasture in their selection. 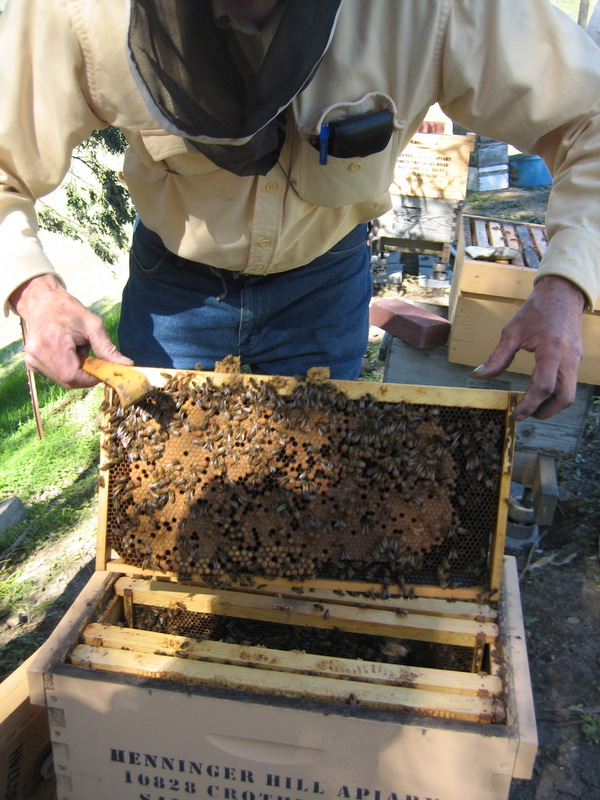 Alan is a founding member and past president of the Santa Clara Beekeepers Guild, the immediate past president of the Delta Bee Club and currently serves on the Executive Board of the California State Beekeepers Association as Research Committee Chair. Both Nella and Alan make numerous presentations on varoius aspects of beekeeping to local groups, schools and beekeeping organizations. Alan and Nella Henninger moved into the house they built on 4 acres off Crothers Road in 1968 and have lived, raised their children and now enjoy the visits of grandchildren there. Both retired high school teachers - Alan in social science and Nella in natural science - they now divide their time between managing the bees and managing the three grandchildren. It's a toss up, in each case, who's managing whom.